Circulation Heater suits gas and liquid applications. Constructed of helical coiled tube cast into aluminum body with replaceable cartridge heater in center, CAST-X 500 is intrinsically safe and will not burn fluids. Stainless steel fluid path assures compatibility with various materials. Non-welded construction supports operation up to 3,000 psi and 350Â°F, minimizes potential leakage, and self drains when mounted vertically. Since gas or liquid never come in contact with heater, CAST-X 500 suits applications requiring fluid cleanliness. St. Louis, MO (June 3, 2008) - Watlow, a designer and manufacturer of electric heaters, controllers and temperature sensors, announces the introduction of the CAST-X 500 circulation heater. This small, lightweight circulation heater is ideal for demanding gas and liquid applications, is intrinsically safe and will not burn the fluids being heated. The CAST-X 500 heater is suited for applications where fluid cleanliness is critical because the gas or liquid being heated never comes in contact with the heater. This is a performance requirement in the semiconductor, analytical and foodservice equipment industries. The heater's applications include the heating of solvent, DI water, air, CO2, nitrogen, diesel fuel and printing ink, as well as packaging sterilization, analytical instrumentation, steam generation and pasteurization in foodservice applications. The CAST-X 500 circulation heater is constructed of a helical coiled tube cast into an aluminum body with a replaceable cartridge heater installed in the center. The cartridge heater can be replaced with a higher or lower wattage unit as required for the application. The aluminum body serves as the heat transfer media between the cartridge heater and the coiled tube where fluid is being heated. The unique construction of the heater allows it to be used where thermally sensitive materials are being heated, such as paints, resins and flammable materials. The aluminum mass acts as a "thermal flywheel" and ensures accurate temperature control of the fluid to prevent degradation. The robust cast-in aluminum construction assures longer heater life and accurate temperature control, and the stainless steel fluid path assures compatibility with many different materials. The heater's non-welded construction provides high pressure operation up to 3000 PSI, operates up to 177°C (350°F), minimizes potential leakage and self drains when mounted vertically. Its compact size reduces space needs in customers' equipment and assures quick response due to its low mass, making it a better overall thermal solution than oversized heat exchangers. The CAST-X 500 is the newest and smallest heater in Watlow's CAST-X product line. The CAST-X 1000 offers a maximum working fluid pressure of up to 1500 PSI and process temperature up to 121°C (250°F). The CAST-X 2000 features a maximum working fluid pressure of 5000 PSI and a process temperature of 93°C (200°F) to 260°C (500°F). Watlow is currently taking orders and shipping the CAST-X 1000 and 2000 in only one day. Since the company's founding in 1922, Watlow has brought its thermal expertise to numerous applications, including semiconductor, plastics processing, foodservice equipment, life sciences, power generation, aerospace and others. 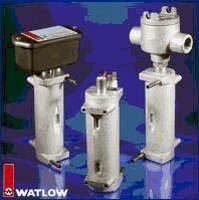 Headquartered in St. Louis, Missouri, Watlow is the largest custom designer and manufacturer of industrial heaters, sensors, controllers and software with offices and manufacturing facilities around the world.